As a part of our Art of Romance package at Zoetry Casa del Mar, we got a sunset cruise around the arch. 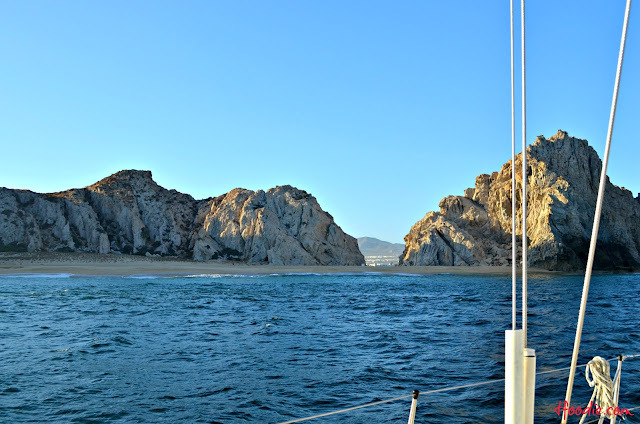 So we took a cab to Cabo San Lucas harbour and marina (around $30) and reached our boat, from the company Cabo Sailing. The Arch is a rock formation located at the southernmost tip of the California peninsula, where the Pacific Ocean and the Sea of Cortes meet. It is also called Land's End or Finisterrae because if you draw a vertical line to the south from there, there would be no land until the South Pole. From the boat, behind the Arch you can see the famous Lovers beach and Divorce beach. They are actually the same beach but one, Lovers, is on the Sea of Cortés side, water here is warmer and calm. On the other side, facing the Pacific, there's Divorce beach, colder water, big waves, rip tides and very deep sea shelf (now you understand the names, right?). During our cruise we saw beautiful rock formations, sea lions lounging, and our crew even caught a fish (which was returned to the sea after the picture); we had drinks, cheeses and cold cuts and saw the sunset on the way back to the marina. Great activity, thanks to Zoetry Casa del Mar & Cabo Sailing!